Azuon - finding cheapest flights ever! Thanks to our smart flight search engine every destination is within your reach! Meet Azuon! 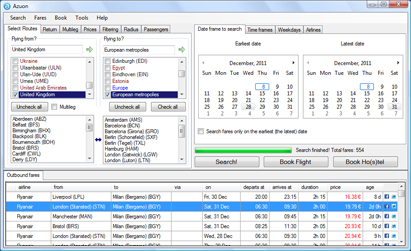 A personal & professional tool that searches multiple airports within any specified date range to find the cheapest possible fares. At the moment there's no better software nor website doing what it does and I challenge anyone to deny it. Ingenious application! It helped me save 100s of euros with it and visit numerous cities in Europe on a tiny budget. Become a fan on Facebook and join our discussion on cheap flights. Follow us on Twitter to get the latest news about Azuon application.